I have to confess this is my boyfriend’s idea. He convinced me to try this one out. It’s a desert somewhere in between a jelly and a pudding. I’ve never been a great fan of jelly but this dessert is unlike anything I’ve ever tried before. You need to give it a couple of spoonfuls before being won over, but after that it’s so moreish you’ll just want to keep going! The recipe is an adaptation from a brilliant Italian recipe book called Bocca by Jacob Kenedy. 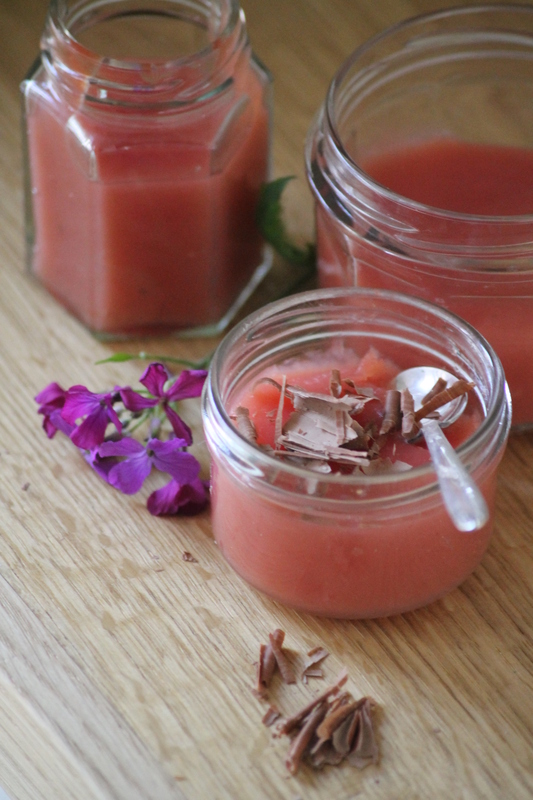 The pudding is made of fresh watermelon and I’ve sweetened it with agave nectar rather than sugar to make it more suitable for young children. You can find agave nectar in most supermarkets nowadays. I’ve started having it on my porridge in the morning. This high fructose syrup is made from a cactus plant and reminds me of maple syrup but without the strong a flavour. My little girl had this pudding just by itself but personally I really liked it with some chocolate shavings on the top for extra greediness! Serves 4-5 -Kids & grown-ups! Cut the flesh from the watermelon and purée the fruit in a food processor. Pass through a coarse sieve, pressing well to extract all the juice. Mix the agave nectar into 900ml of the juice and set over a medium flame and bring to a boil. Mix the cornflour to the remaining 100ml juice. As soon as the pan boils whisk in the cornflour mixture. Bring it back to a boil then take off the heat and ladle the concoction into glasses/ jars or jelly moulds. Refrigerate until set. Serve sprinkled with dark chocolate shavings.